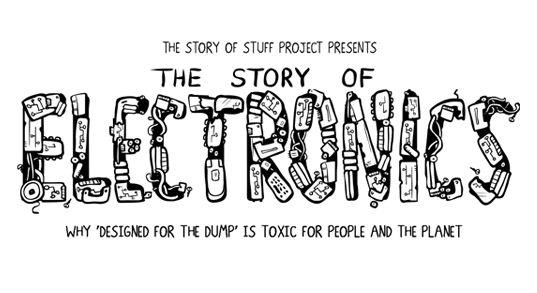 We try to shed our own light on the issues surrounding e-waste recycling but we have to hand it to Annie Leonard, whose new video, The Story of Electronics, hits the problem right on the nose. From the wonder woman who first brought us The Story of Stuff in 2007, the new tale follows the same format again to shed light not only on the ineffective world of e-waste recycling, but the root of the problem as well — bad design that goes into making things obsolete. Check out the video after the jump. The video focuses on the “design for the dump” strategy of technology companies who continually make products that will quickly become obsolete and then be hard to upgrade. This design cycle causes consumers to keep buying and buying to stay on the edge of technology all the while dumping out their old electronics, either into landfills or even e-waste recycling centers — which are not by any means the solution to the problem. As we’ve written before, those electronics get sent to developing countries where they poison the communities and people that work on and near them. Leonard also sheds light on some disturbing things about the health of the people that assemble our electronics and how our gadgets could be poisoning us as well. Taking that into account, the process of making electronics is poisonous every step of the way from extraction to production to use to disposal. The Story of Stuff Project has a solution that is not only ingenius, but achievable. We take this video as a challenge to technology companies to really get on the edge of good design. They need to start thinking about not only how to make great electronics, but how to make them sustainable for the earth that we live on. 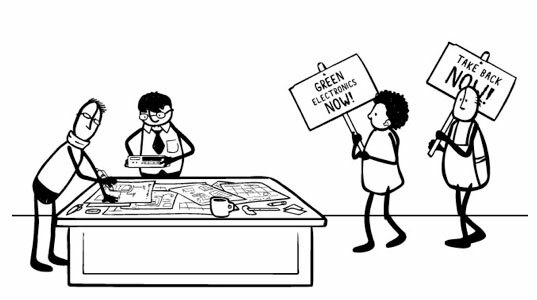 We try to shed our own light on the issues surrounding e-waste recycling but we have to hand it to Annie Leonard, whose new video, The Story of Electronics, hits the problem right on the nose. From the wonder woman who first brought us The Story of Stuff in 2007, the new tale follows the same format again to shed light not only on the ineffective world of e-waste recycling, but the root of the problem as well -- bad design that goes into making things obsolete. Check out the video after the jump.